Oral Exercises: 1-55059-097-9, 250 pp. Written Exercises: 1-55059-096-0, 175 pp. 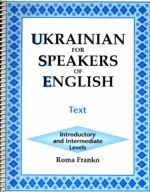 Ukrainian for Speakers of English is intended for individuals who have no knowledge of Ukrainian, but it is a useful resource for anyone with a limited or incomplete knowledge of the language. Although it was developed for senior high school or university students, it has been used successfully for home study. The material is presented for learners who speak English, but who may not know the formal rules of English grammar. Before a new Ukrainian structure or grammatical rule is introduced, students are first reminded about what they know about a similar structure or rule in English. The grammar explanations are brief and simple; they convey only as much information as a student can be expected to assimilate in the early stages of learning a second language. Numerous examples, summaries, and charts assist the student to organize and remember the information that is presented. The student is able to apply what has been learned about a particular structure or way of saying things in Ukrainian by actively engaging in carefully coordinated oral exercises and mini-conversations that are designed to be practiced in class, in the language lab, or at home. The written exercises provide a means of checking how thoroughly a point or structure has been learned. The systematic organization of the material ensures that students acquire the ability to use Ukrainian competently and lays the foundations for further formal and informal mastery of the language and for the enjoyment of Ukrainian literature. Dr. Franko was a faculty member at the University of Saskatchewan for over 25 years, and served as Head of the Department of Slavic Studies and the Department of Modern Languages. In addition to teaching introductory and advanced Ukrainian language and literature courses, she served on the Saskatchewan Education Curriculum Committee for more than 20 years, and conducted workshops, seminars, and university methods courses in the three prairie provinces and Ontario for teachers of Ukrainian at every level of instruction. Ukrainian for Speakers of English reflects her broad and varied experience teaching the Ukrainian language and developing instructional materials for adolescent and adult learners. These materials include the first Canadian high school correspondence program which she prepared for Saskatchewan Education in the early 1960s and a three-year program using the audio-visual approach to teaching Ukrainian at the high school and university levels.